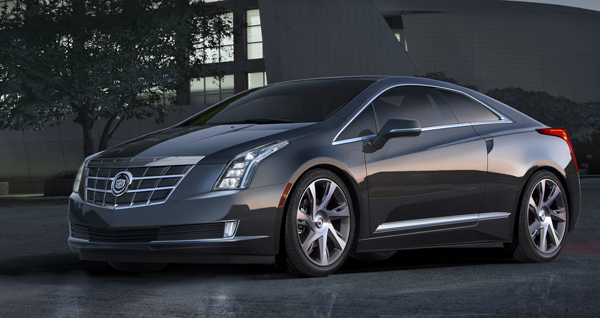 The wildly anticipated 2014 Cadillac ELR enters the hybrid sports performance market with a bang. The 2014 Cadillac ELR has been hotly anticipated by Caddy enthusiasts and green driving advocates since it was first announced. Kelley Blue Book recently got their hands on the luxury carmaker’s electric coupe and seemed more than impressed with what Cadillac’s engineers have created. Based upon and very nearly identical to the Converj Concept that premiered at the 2009 North American International Auto Show, the 2014 ELR is Cadillac’s attempt to enter the hybrid sports performance segment to compete with the likes of Tesla, Porsche, and BMW. As KBB points out, the ELR is distinctly Cadillac because of its familiar design cues, including vertical lighting and angular “Art and Science” design language. As can be expected, it’s luxurious and stocked with cutting edge technology both inside and out. Test driving put the Cadillac ELR’s average charge time somewhere between four-and-a-half and ten-and-a-half hours. Two points of contention for potential buyers have been the powertrain and price of the 2014 Cadillac ELR. There are those skeptical about the ELR’s abilities given that it shares the bulk of its makeup with the powertrain of the Chevrolet Volt; fortunately, KBB reassures us that a number of suspension and chassis components specifically for the ELR make it an altogether different beast. These include HiPer strut front suspension, semi-independent rear suspension, and Continuous Dampening Control. As far as the sticker price, KBB seems undeterred in recommending the $75,995 starting price, stating that the 2014 Cadillac ELR is “the amalgamation of two niche vehicles,” and therefore “its exclusivity factor helps rationalize its sticker price.” Truly, inimitability is part of Cadillac’s appeal, and when compared to the comparably-priced yet less-powerful Tesla Model S and the significantly more expensive Porsche Panamera S E-Hybrid, it’s the most logical choice in the segment (particularly after factoring in an available $7,500 Federal tax credits and other state and local tax breaks). For more information on the 2014 Cadillac ELR as its early 2014 release date looms, keep your eyes glued to The News Wheel!